A cast of New York–based performers will read texts by authors including Roald Dahl, Charles Baudelaire, James Baldwin, and Yiadom-Boakye herself in a special summer public program taking place in the New Museum’s Sky Room. Yiadom-Boakye’s creative practice moves between visual art and literature. As both a writer and a painter, she creates quotidian and otherworldly characters who emerge and develop on the page or the canvas, remaining distinct to the medium in which they were rendered. For this program, Olivia Rose Barresi, Carol Carter, Maurice McPherson, and Yvonna Pearson will read poetry, short stories, and scripts selected by Yiadom-Boakye, exploring what emerges when these texts become unmoored from their time and place of origin. Artist talks and conversations in 2017 are sponsored by First Republic. Education and community programs for “Lynette Yiadom-Boakye: Under-Song For A Cipher” are supported, in part, by American Chai Trust. 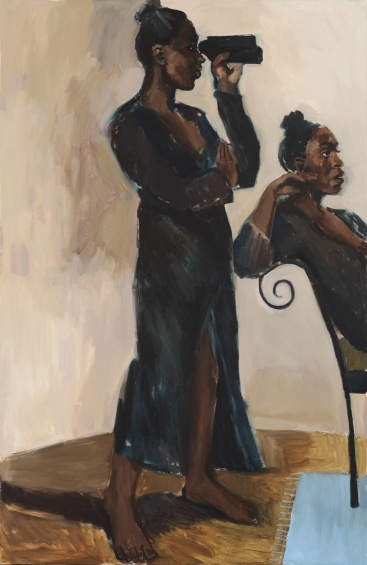 Full support for “Lynette Yiadom-Boakye: Under-Song For A Cipher” can be viewed here.